In Penitence, painting by William-Adolphe Bouguereau (academic realism, 1871). In art (especially visual art such as drawing, painting or sculpture), realism means to make the artwork such that it closely resembles real-life scenes, objects and persons. Such a work is called realistic. The opposite of realism is abstraction, which is well-known from modern art, but also from cartoon drawings, comics and cartoon animation. In painting, taking realism to an extreme is known as photorealism. This results in artwork that looks so realistic that a viewer can hardly distinguish it from a photograph. Realism requires good observation skills when creating the art from a real-world model or scene, or great knowledge of anatomy, proportions, colors, textures, light and shade, etc. when creating the artwork from one's imagination. 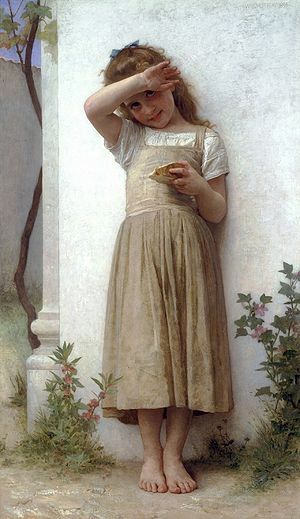 Painters who mastered realism include William-Adolphe Bouguereau. Spanking artists who create images of a high degree of realism include Barbara O'Toole. Also, artists who create rendered spanking art produce highly realistic (near-photorealistic) images. These include ArnDaBrat, Banjo, EC, and Invidia, to name just a few. This page was last edited on 25 January 2008, at 19:07.